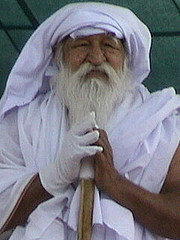 Jai Gurudev panth of Sant Tulsi Das ji of Mathura is an offshoot of Radha Soami Panth, Agra. Radha Soami panth was started by Seth Shiv Dayal Singh Ji in Agra, India. Sant Tusli Das ji of Jai Gurudev Panth did a prediction in 1971 about another saint whom he addressed as a complete saint. He gave a very good description about the age and other characteristics of that Saint. Sant Tulsi Das ji wrote about that complete in his newsletter "Jai Gurudev ki Amarvani"
Sant Tulsi Das ji's own statement proves that he was not a complete saint. Rather he has indicated towards some other saint who would change the world.